Linsey Penny of the Saddleback Farm Shop is our Green Labyrinth Apprentice of the Month for March in recognition of her hard work, commitment and challenging nature of her job with all of her responsibilities. 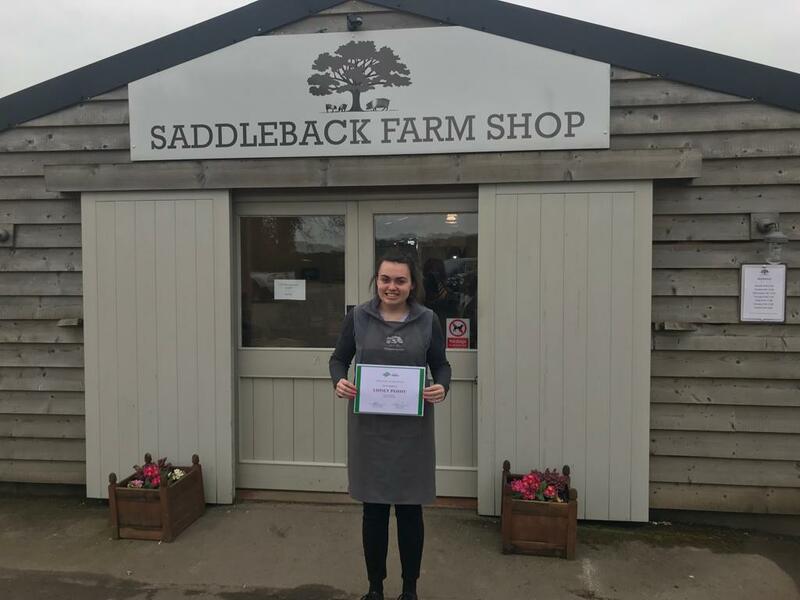 Our team went to the Saddleback Farm Shop to present her certificate. Discover her apprenticeship story below. Linsey is currently doing her level 3 apprenticeship in digital marketing with Green Labyrinth. What did you decide to do an apprenticeship rather than go to college? I wanted to learn about marketing however an apprenticeship appealed as I could earn while I learn. An apprenticeship was a better option for me as I am a practical person and the classroom full time wasn’t really for me. What sort of activities do you do in your apprenticeship role? My job consists of doing mail-shots, organising events, advertising campaigns, social media, creating posters and lots of other activities. The job is very varied and I have developed lots of new skills including things like time management. Have you received lots of support and help during your apprenticeship? Yes, Pete my assessor supports and helps me enormously and Green Labyrinth has really supported me throughout my apprenticeship. I find the training sessions really useful and its especially great to meet other apprentices and share ideas. What would you say to someone considering an apprenticeship? Go for it 100%! It’s the way forward! You can learn and earn without the debt and thats huge. It’s a thumbs up for apprenticeships from Linsey. If you would like to know more about apprenticeships either for yourself, a member of your team or even if your organisation is looking to recruit an apprentice for a new role get in touch with our team today.